A closed door may slow the spread of smoke, heat and fire. Install smoke alarms in every sleeping room and outside each separate sleeping area. Install alarms on every level of the home. Smoke alarms should be interconnected. When one sounds, they all sound. Test your smoke alarms at least once a month. Press the test button to be sure the alarm is working. 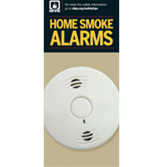 More about installation and maintenance of home smoke alarms. Download this free tip sheet on the use and maintenance of smoke alarms. Working smoke alarms give you early warning so you can get outside quickly. Download our tip sheet on smoke alarms. This report focuses chiefly on smoke alarm presence and performance in home fires reported to local fire departments in the United States. Download this free NFPA report. NFPA's Dan Doofus reminds you to have enough smoke alarms in your home, test them monthly, and replace them every 10 years. See more NFPA videos about smoke alarms. In 2012-2016, smoke alarms sounded in more than half (53%) of the home fires reported to U.S. fire departments. Almost three of every five home fire deaths resulted from fires in homes with no smoke alarms (40%) or no working smoke alarms (17%). 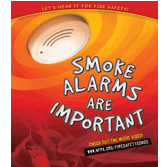 No smoke alarms were present in two out of every five (40%) home fire deaths. The death rate per 1,000 reported home fires was more than twice as high in homes that did not have any working smoke alarms compared to the rate in homes with working smoke alarms (12.3 deaths vs. 5.7 deaths per 1,000 fires). NFPA's Smoke Alarms are Important Brochure and its online music video remind kids to jump to their feet when the smoke alarm sounds! Smoke alarms are vital for fire safety and these new NFPA brochures explain how they save lives.